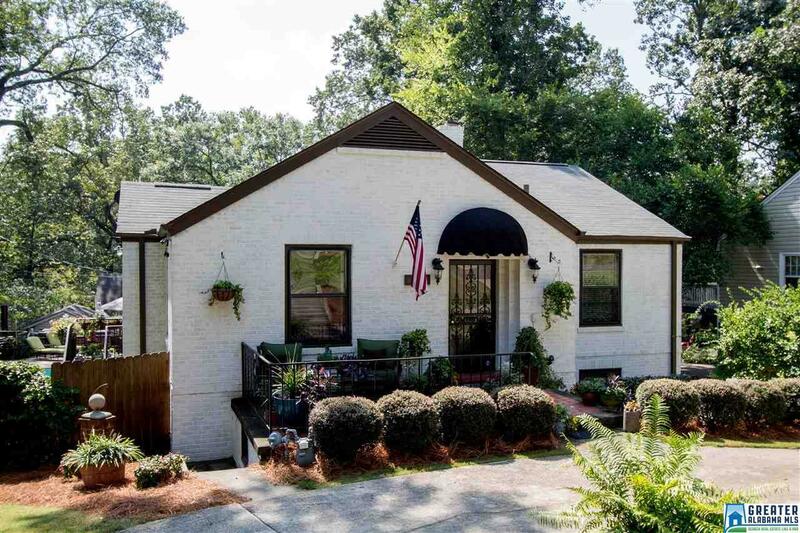 1943 20th Ave S, Birmingham, AL.| MLS# 810910 | Richard Jacks UABLIVING.com 205-910-2297 | Birmingham AL Real Estate | Contact us to request more information about our Homes for Sale in the Birmingham AL area. Featured in LIFE Magazine in 1953, this adorable cottage off Diaper Row beams with curb appeal and charm throughout! It is the perfect outdoor entertaining home with a lovely pool, hot tub, large deck area and beautiful backyard with an outdoor fireplace and patio. Inside find hardwood floors, neutral colors, marble fireplace, 4 bedrooms and 3 full baths. Natural light floods the living room, dining room, kitchen and 2 bedrooms and bath on the main level. Downstairs are 2 more bedrooms and 2 full baths, along with a den and a wet bar, office, laundry and large storage room. This would make a wonderful inlaw suite or apartment as it has access from the driveway. Brick exterior, roof 2 years old and interior walls are poured concrete. Conveniently located and minutes from English Village, Homewood, Samford and UAB, shopping and gourmet restaurants. This home has so much to offer - you can even enjoy an incredible view of the Magic City 4th of July fireworks from your own backyard! Driving Directions: Leaving English Village, Go 21st Avenue South, Under Highway, Turn Right On 20th Street South, Left On 20th Avenue South, 2nd House On The Left.